(Fiddler2 Only:) Install and launch the EnableLoopback Utility by clicking the Win8 Config button. Check the box next to each application that will send traffic to Fiddler. This requires Administrator privileges. Now these applications can send traffic to Fiddler. To allow Unit Tests in Visual Studio 2012 to send traffic to Fiddler, click the AppContainer Loopback Exemption Utility Refresh button while the Unit Test is running. An AppContainer for the Unit Test will appear. Check the box for this AppContainer. Learn more. An alternative to using the AppContainer Loopback Exemption Utility is to declare the privateNetworkClientServer permission. Enable Fiddler HTTPS-decryption feature. A Warning dialog appears. 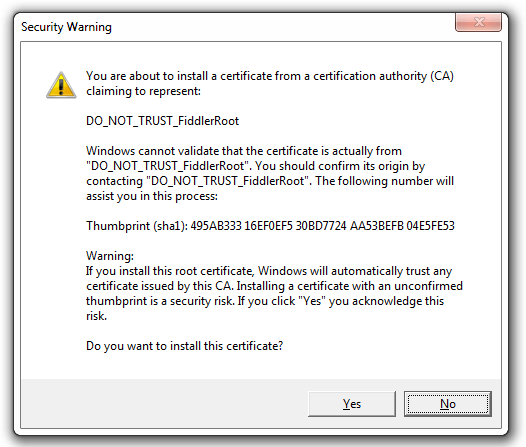 Click Yes to trust the Fiddler Root certificate. A Security Warning dialog appears. Click Yes to install the Fiddler Root certificate. The User Account Control dialog appears. 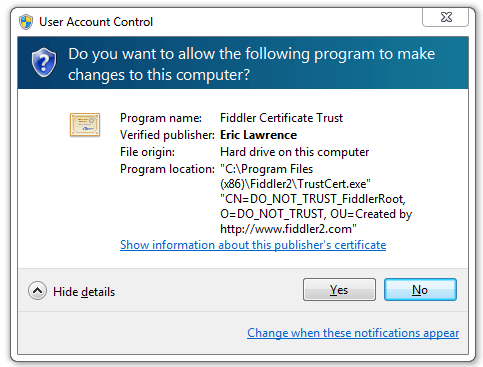 Click Yes to place the Fiddler Root Certificate into the machine-wide Trusted Root Certification Authorities store. The TrustCert Confirmation dialog appears. Click Yes.